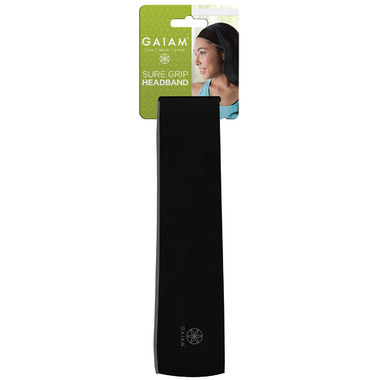 This 2” Gaiam Sure Grip Headband is constructed of moisture wicking fabric to keep you cool and focused, while a silicone stripe keeps the band securely on your head. Tame any flyaway hairs and remain cool! Materials: 45% Polyester, 42% Nylon and 13% Spandex. It seemed to stay on my head okay but I didn't find it as comfortable as I had hoped and the strip to hold it in place seemed to itch my head. I was kinda disappointed in it. This headband stays firmly in place but is still very comfortable. Also keeps sweat off of my face while working out. I get that this is ridiculously expensive but it works better than any other hairband I have owned!! It stays in place and doesn't lose its shape like the hundred of others I have tossed out. It will last a long time (maybe forever) and hand washes easily.